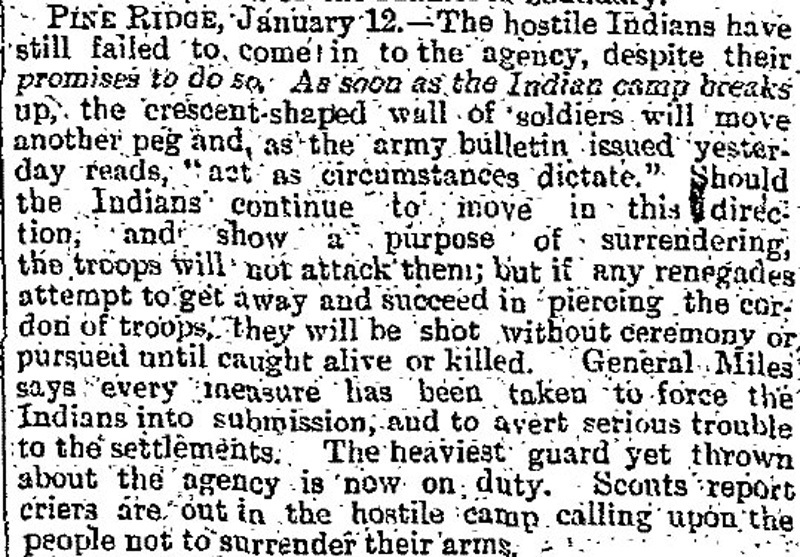 PINE RIDGE, January 12.—The hostile Indians have still failed to come in to the agency, despite their promises to do so. 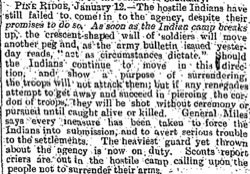 As soon as the Indian camp breaks up, the crescent-shaped wall of soldiers will move another peg and, as the army bulletin issued yesterday reads, "act as circumstances dictate." Should the Indians continue to move in this direction, and show a purpose of surrendering, the troops will not attack them; but if any renegades attempt to get away and succeed in piercing the cordon of troops, they will be shot without ceremony or pursued until caught alive or killed. General Miles says every measure has been taken to force the Indians into submission, and to avert serious trouble to the settlements. The heaviest guard yet thrown about the agency is now on duty. Scouts report criers are out in the hostile camp calling upon the people not to surrender their arms.